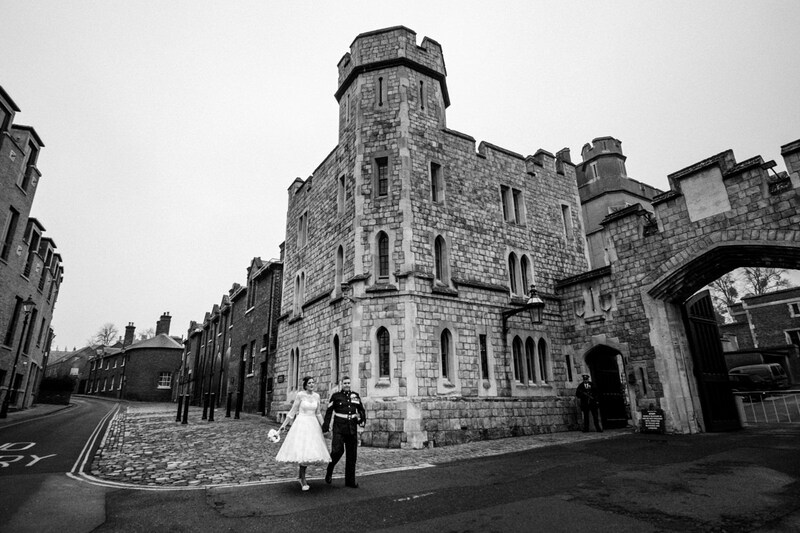 Danielle and Ian’s Harte and Garter Hotel wedding in Windsor last December last year had something of the fairytale about it. 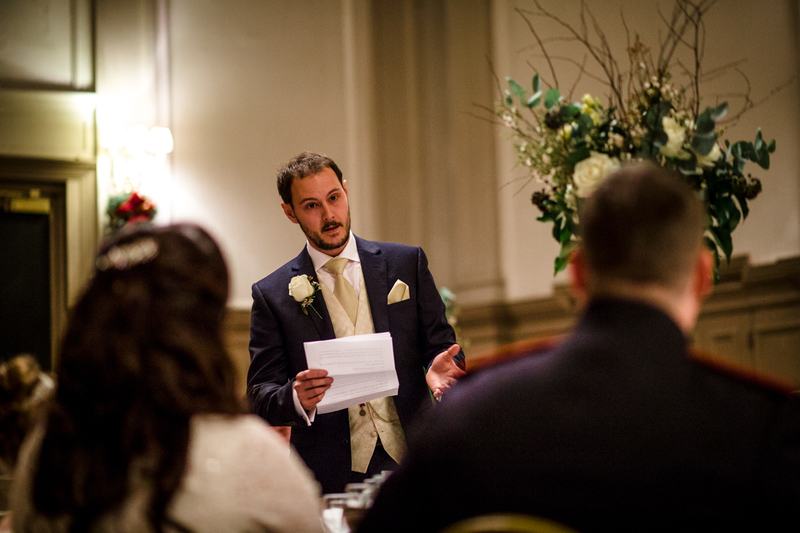 And was made even more special by a surprise last minute appearance – but I’ll come to that later. 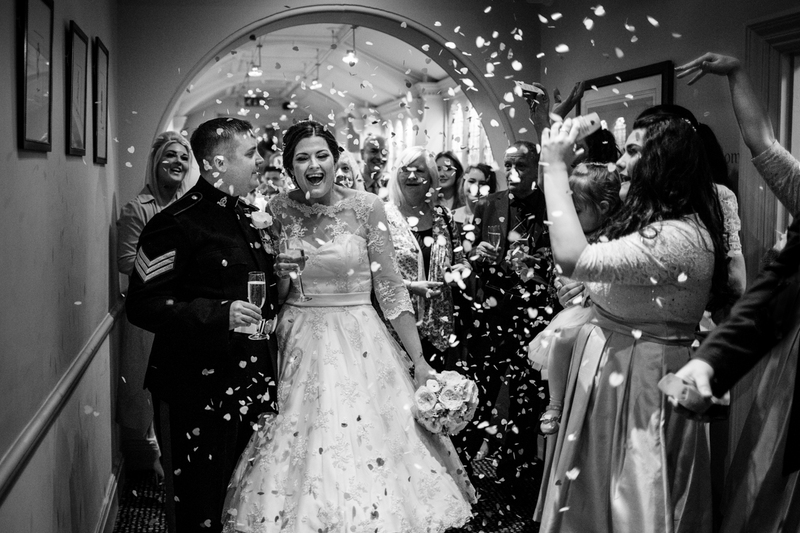 When Danielle first contacted me, with one of the nicest and funniest emails I’ve ever received, I knew this was going to be a joyous and moving wedding to photograph. 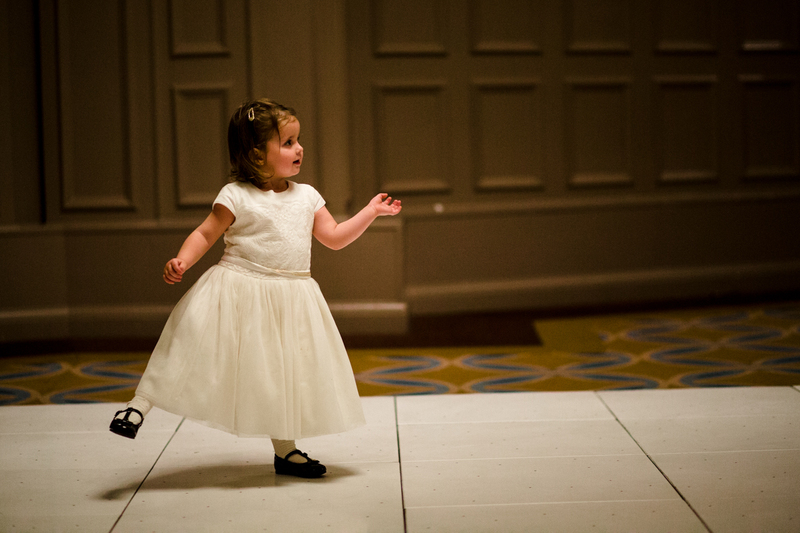 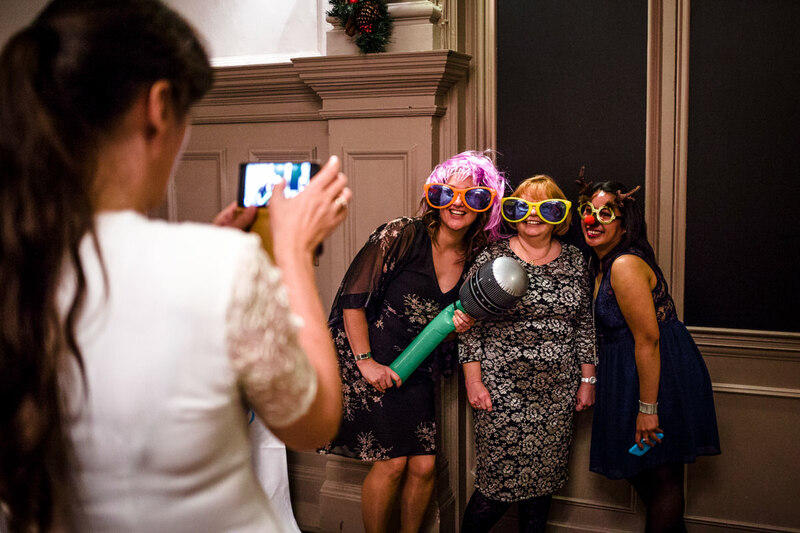 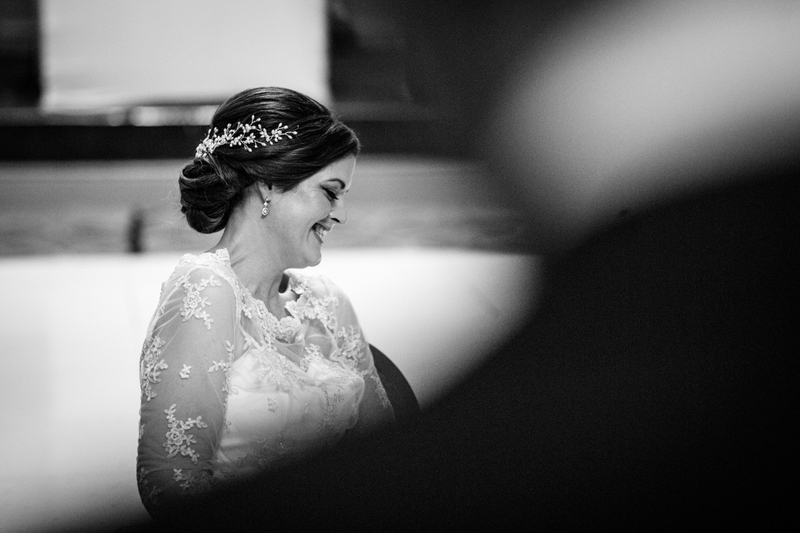 Add to that Danielle’s liking for documentary wedding photography – real and (mostly) unposed – and I was immediately taken. 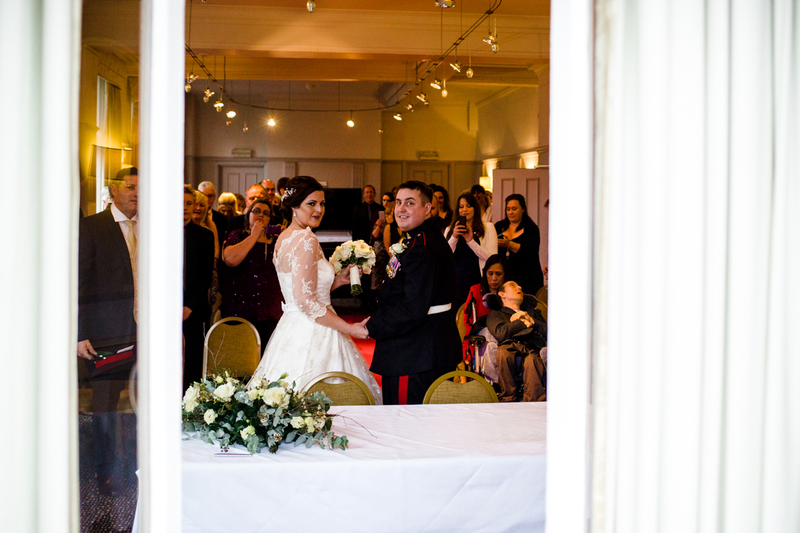 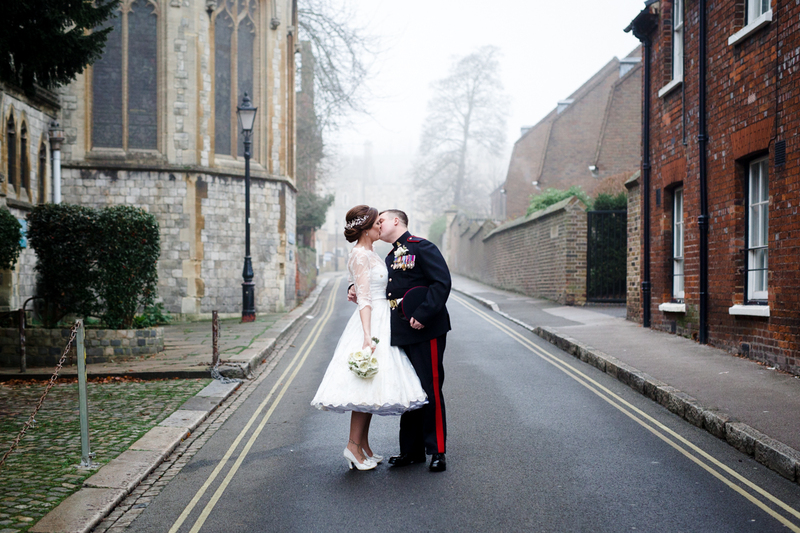 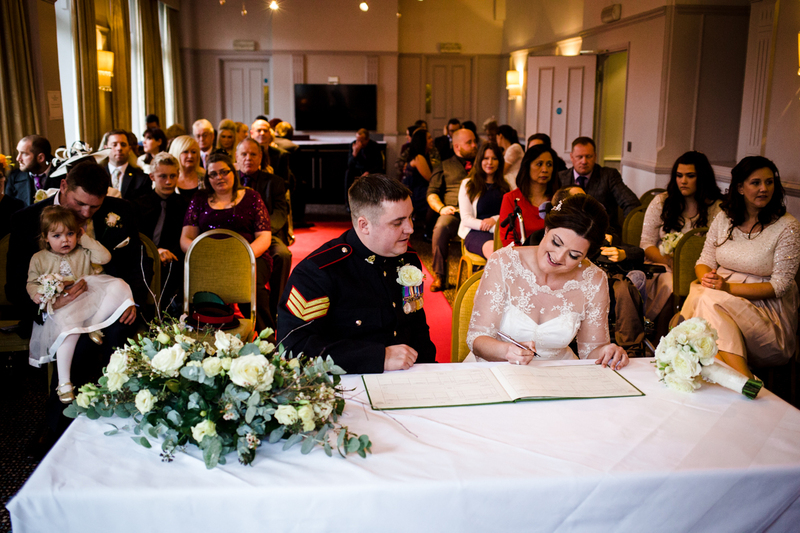 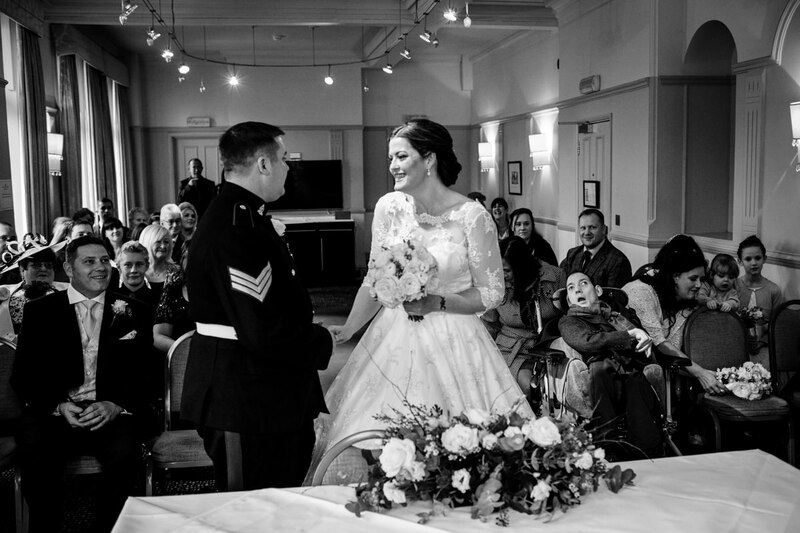 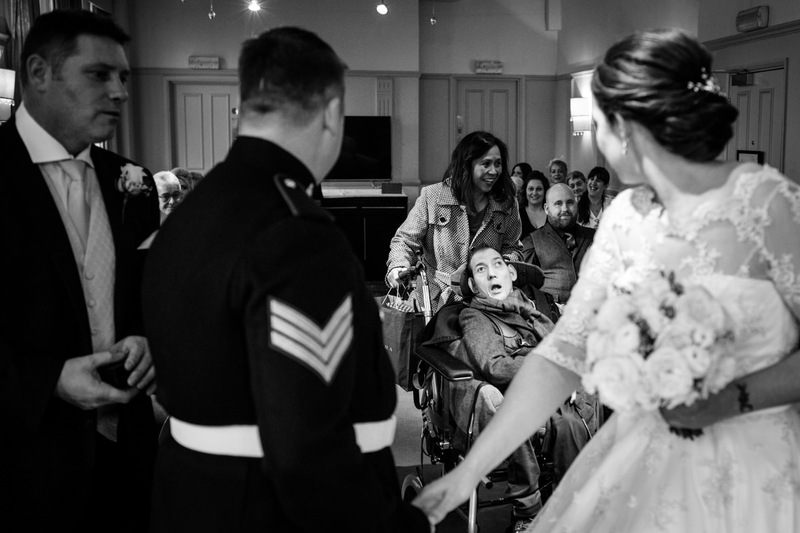 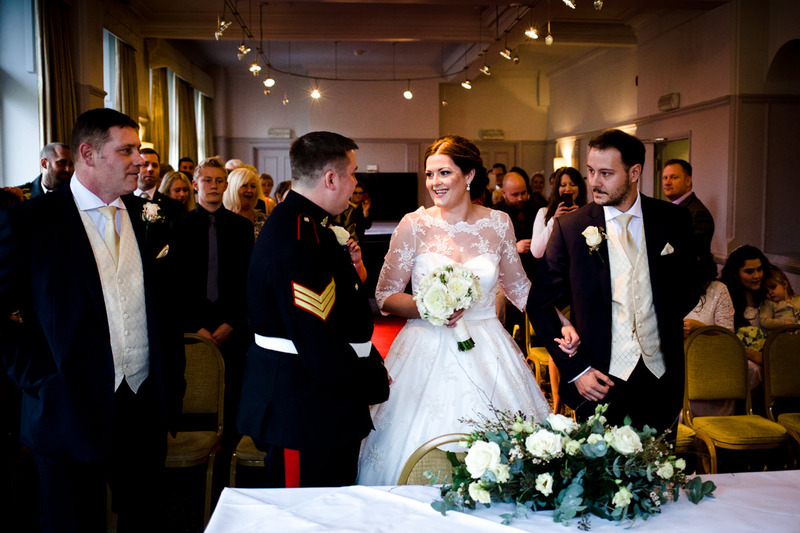 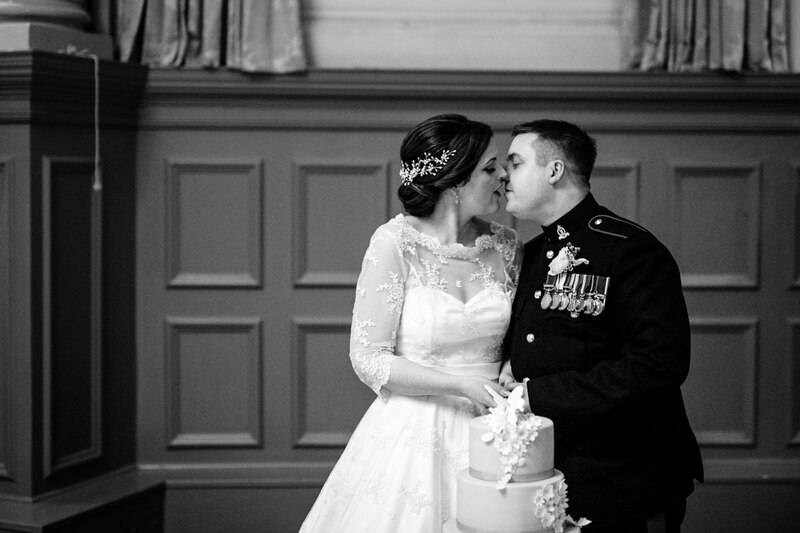 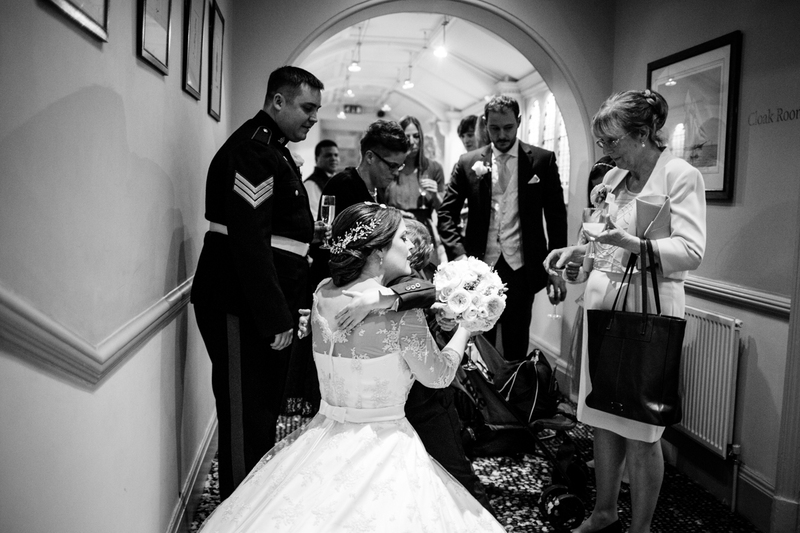 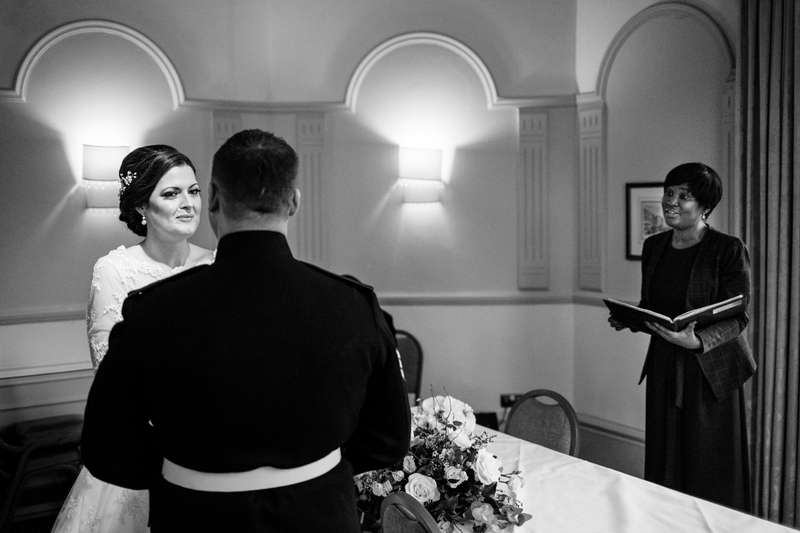 Ian is in the Coldstream Guards, based in Windsor, so their decision to get married at the Harte and Garter Hotel right opposite Windsor Castle was just perfect. 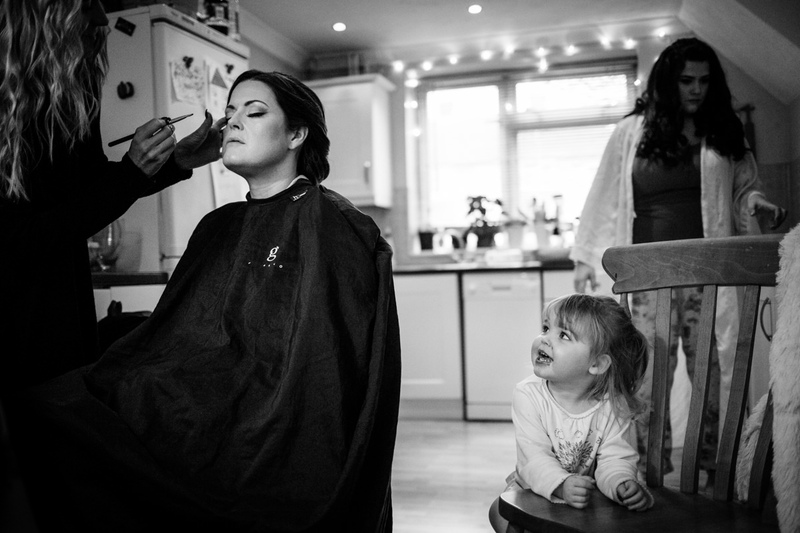 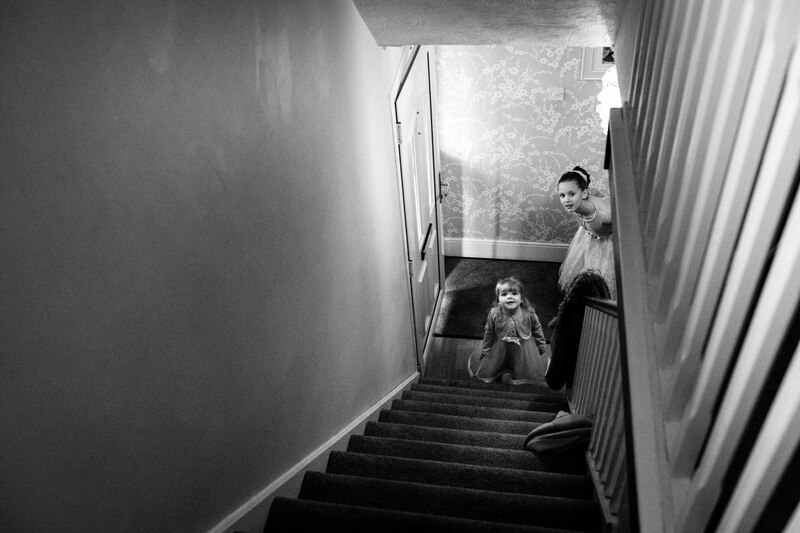 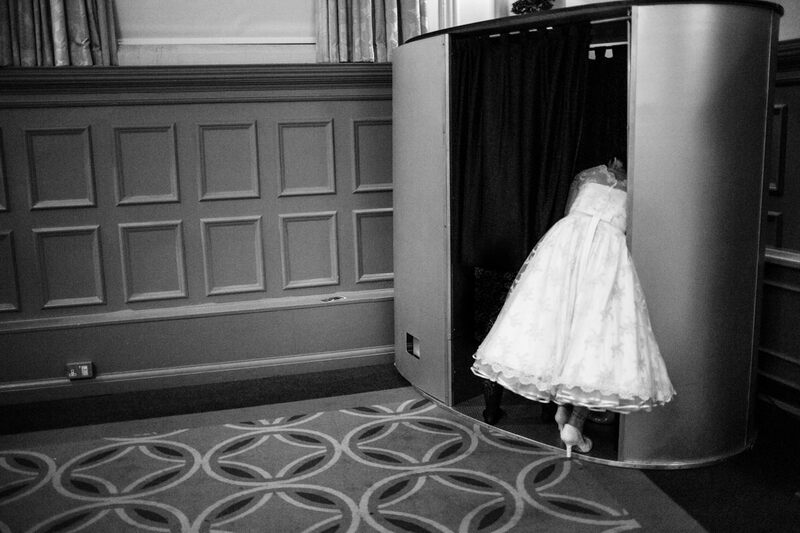 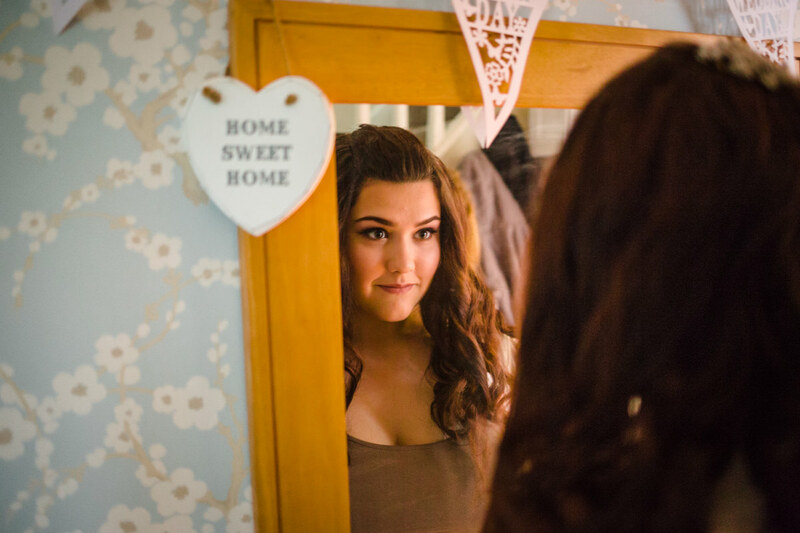 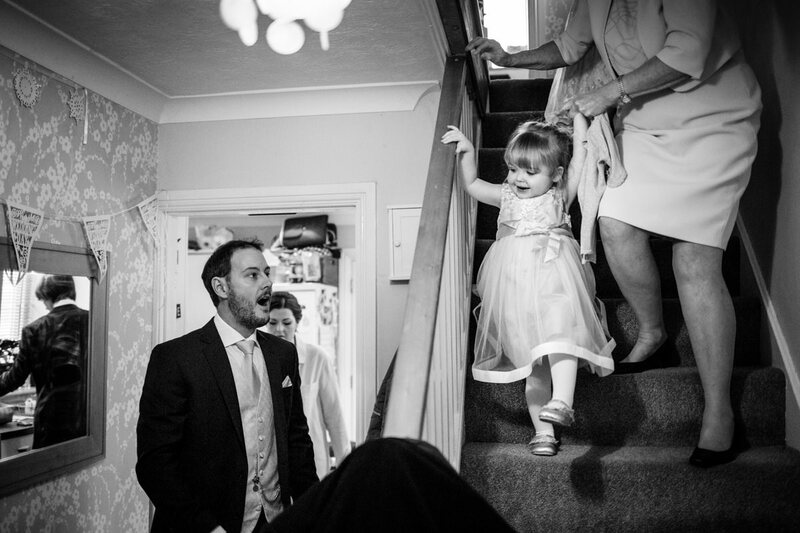 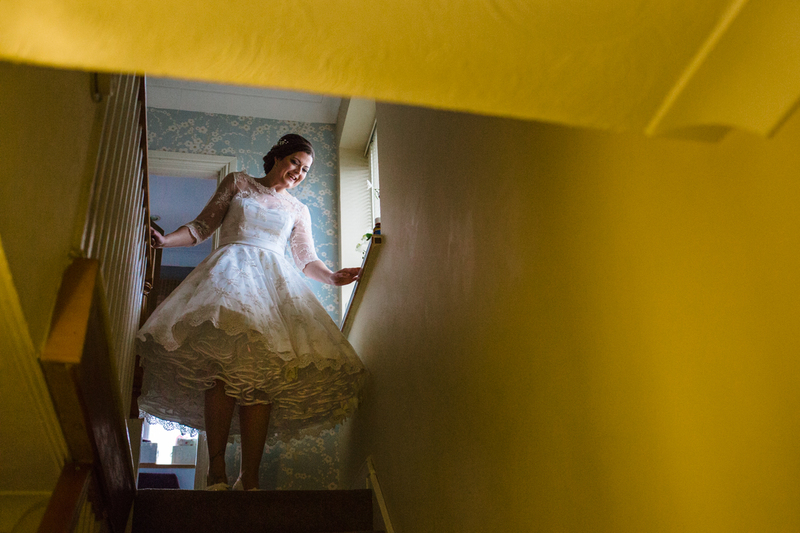 The day started in Farnborough, Hampshire, where Danielle got ready with family and friends. 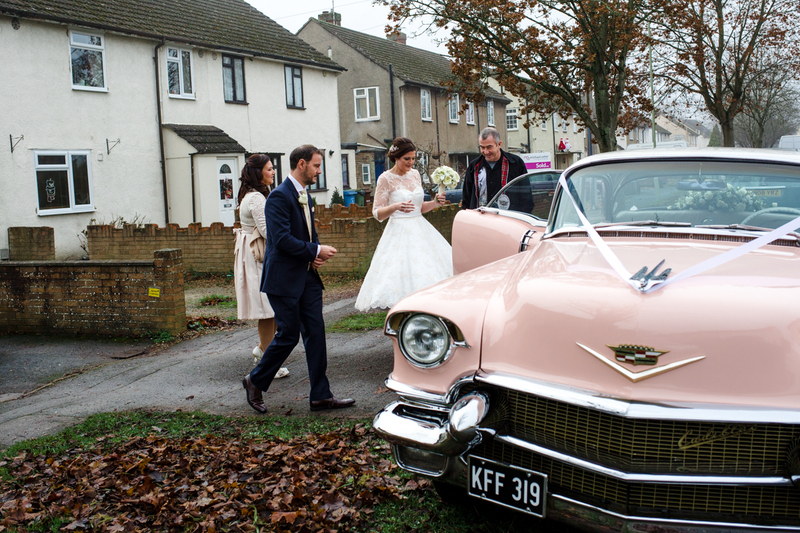 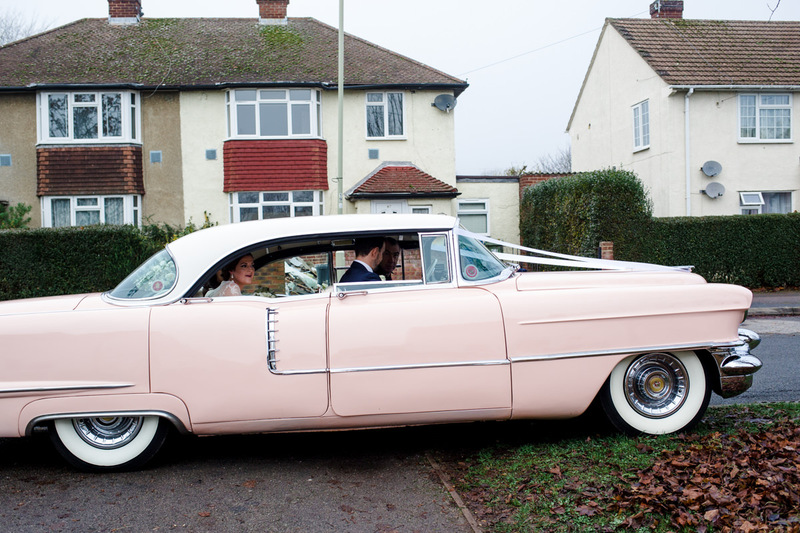 She looked stunning in her Fifties A-line dress and was driven to Windsor in a pink Cadillac. 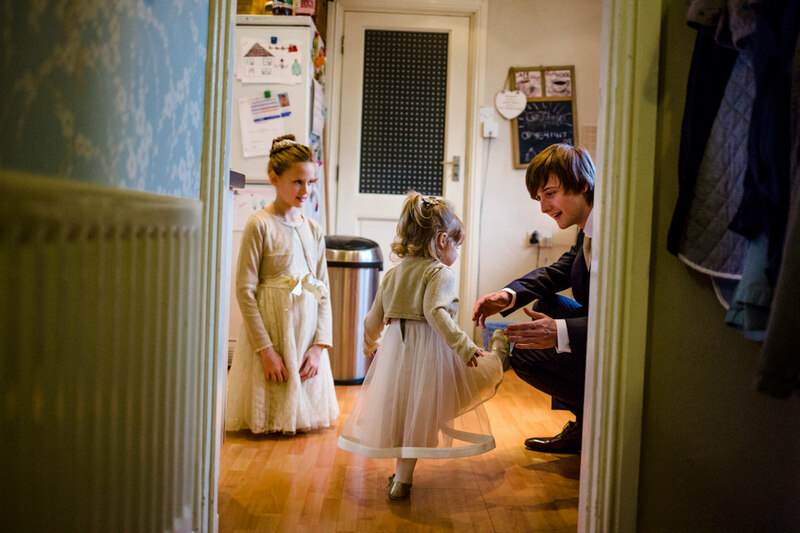 What else!? 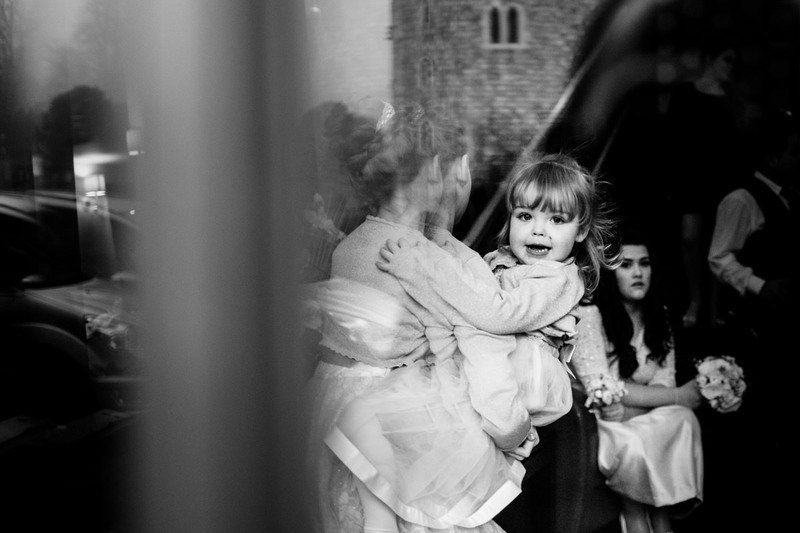 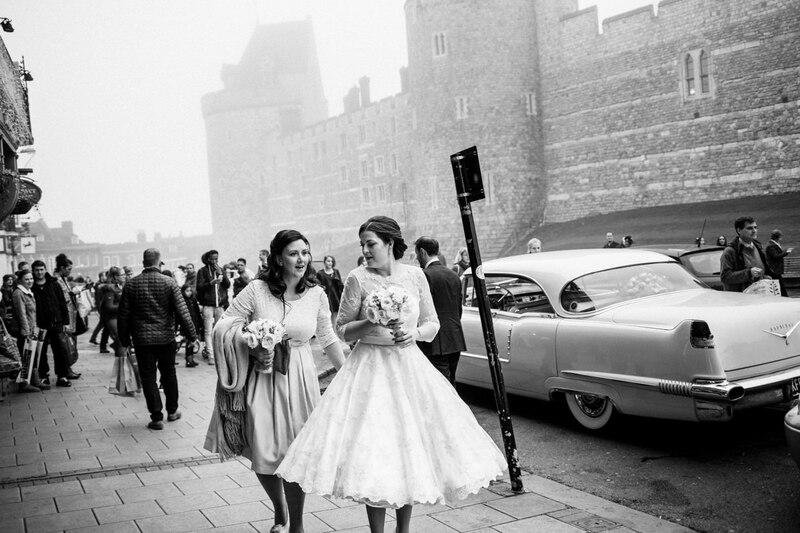 When she stepped out of the car with her bridesmaid, Jo, and with the walls of the Castle behind her, it made for one of those timeless wedding photographs. 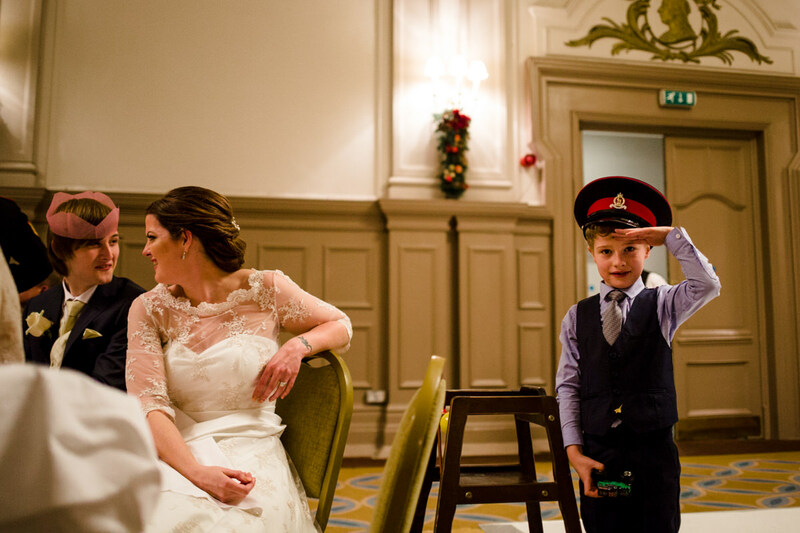 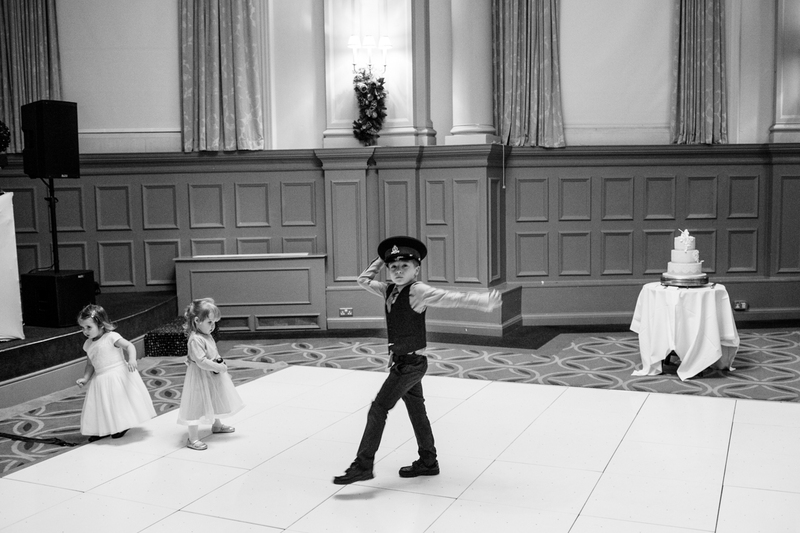 Waiting in the Lancaster Suite at the Harte and Garter was Ian, in full military uniform. 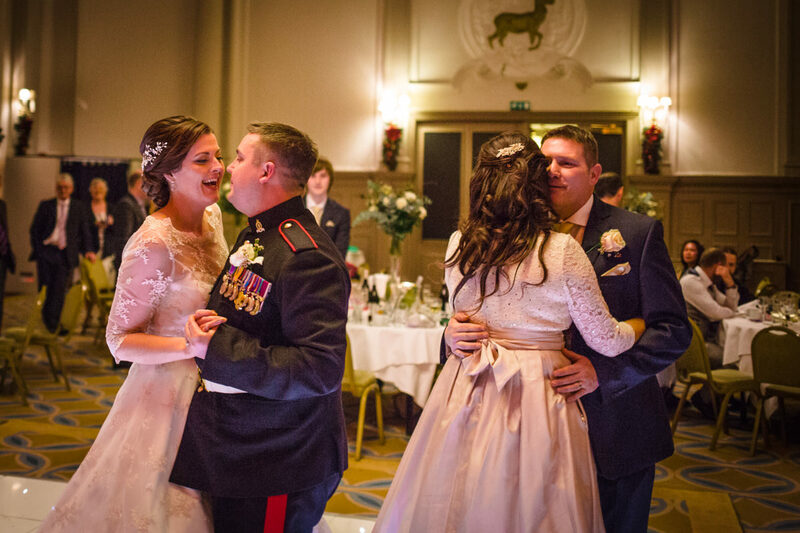 And almost everyone else was there too when Danielle swept in. 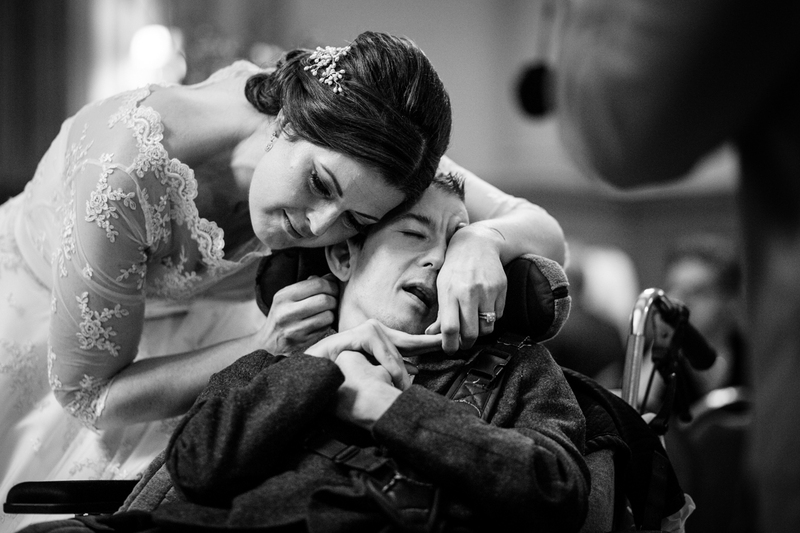 But no one knew if her brother Nicky was well enough to make it. 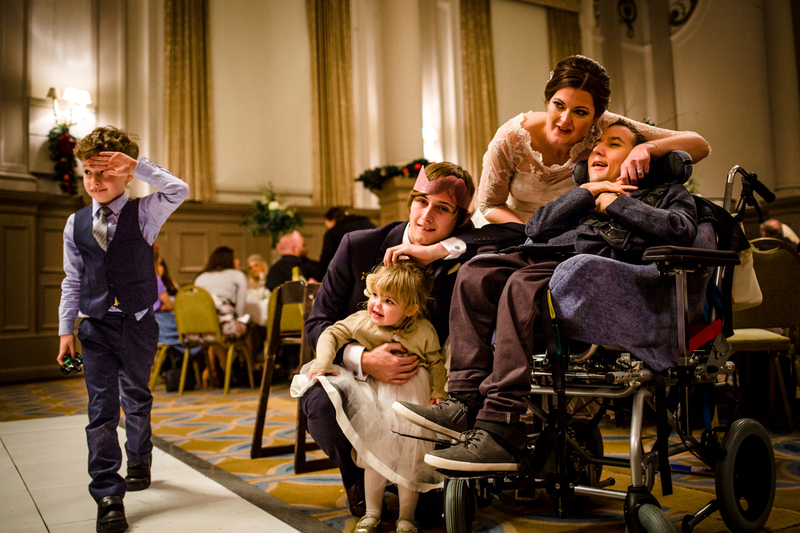 Then just as the ceremony started Nicky came barrelling into the room in his wheelchair. 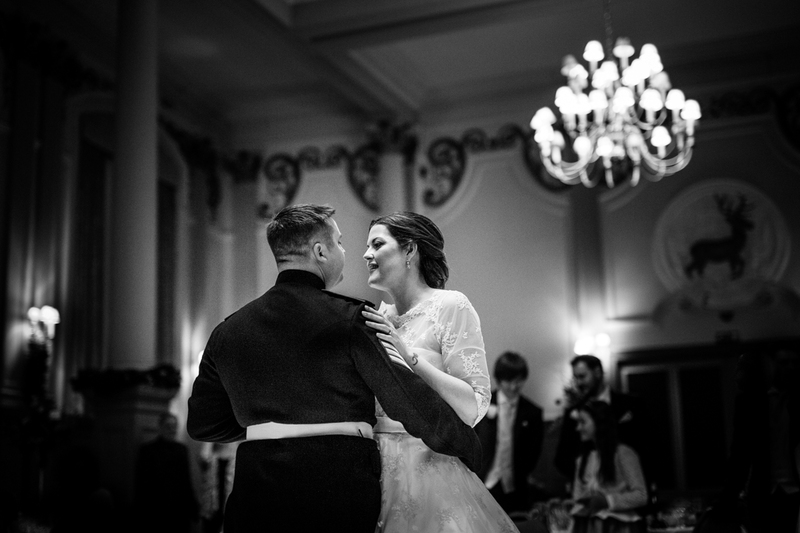 There was an audible ahhh and it was a lovely surprise for Danielle and Ian. 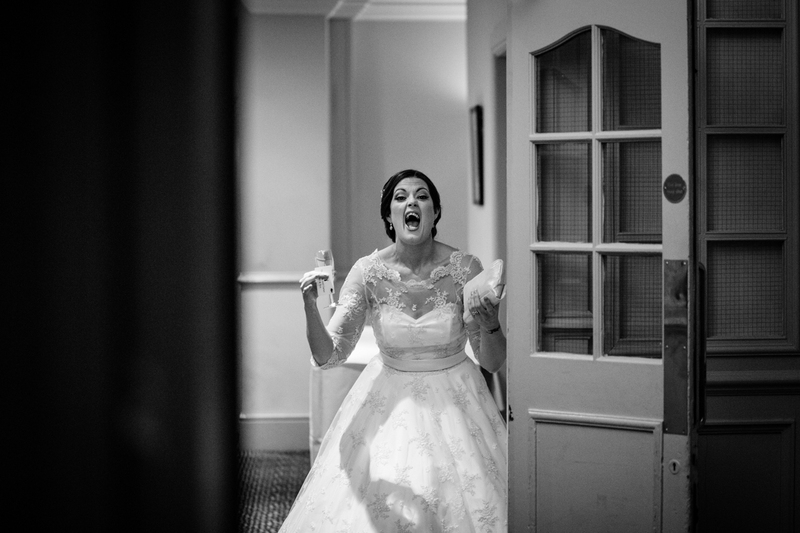 When couples say that they don’t really want any formal pictures of themselves, I say, that’s fine by me. 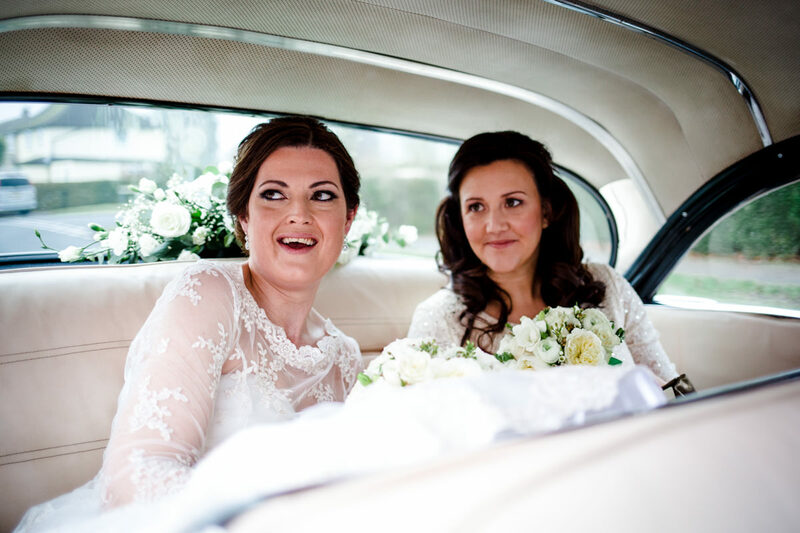 But I always ask if they might not regret having one or two, just to make sure. 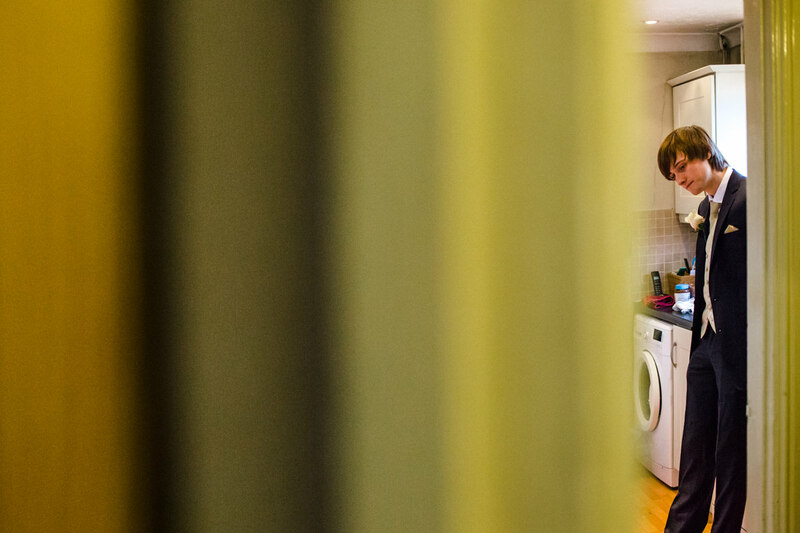 Also, I can usually tell if the real reason might be because they just don’t like having their picture taken. 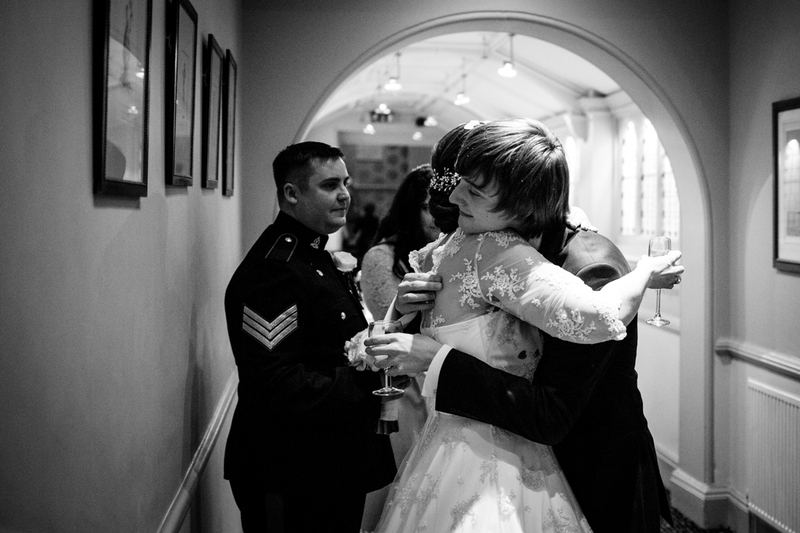 This was the case with Danielle and Ian. 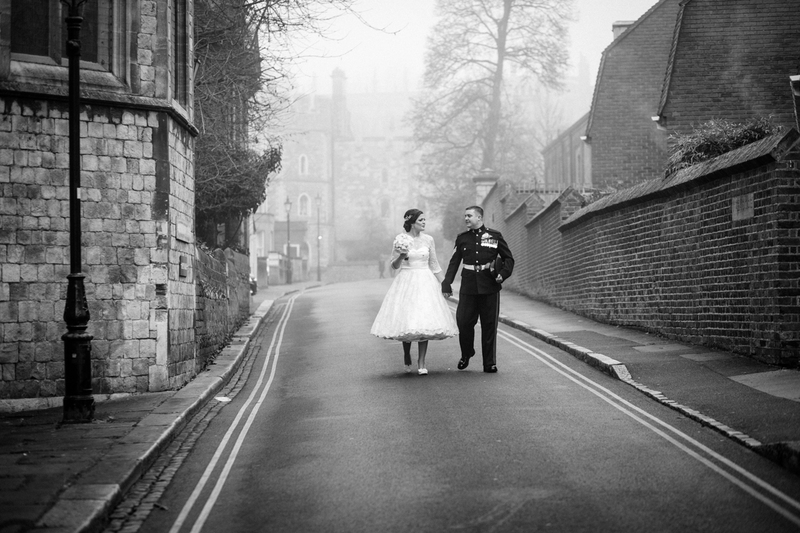 So I suggested that we should just go for a stroll through the town towards a place they really liked. 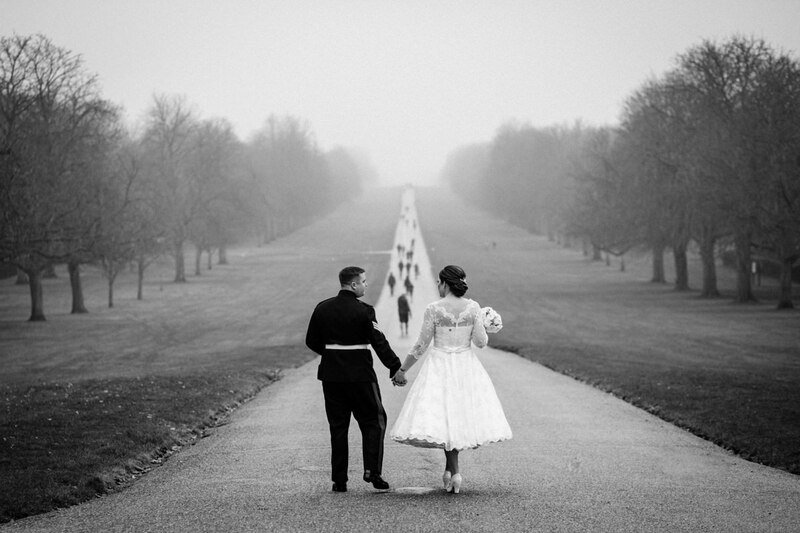 In our pre-wedding meeting in Windsor, they’d suggested we head for the famous Long Walk, the 2-and-a-half-mile straight path through Windsor Great Park to the Castle gates. 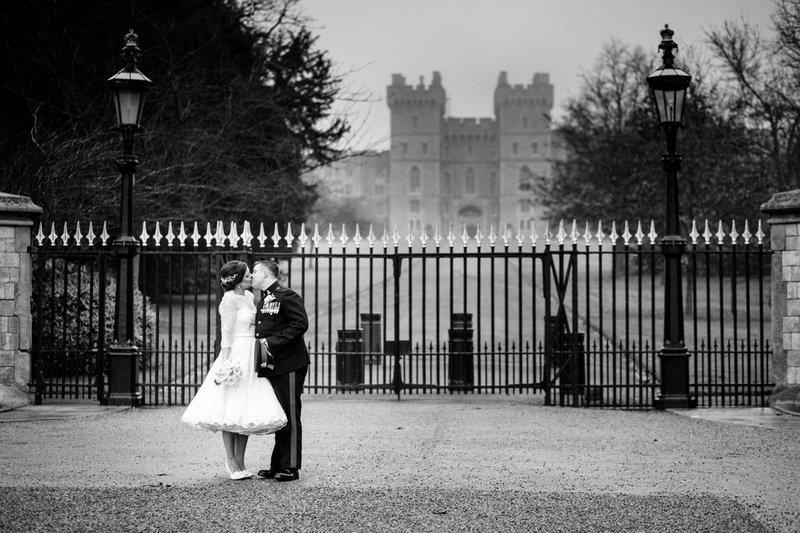 It’s a really beautiful place and it made for a very relaxed way of having a few semi-posed wedding photos taken. 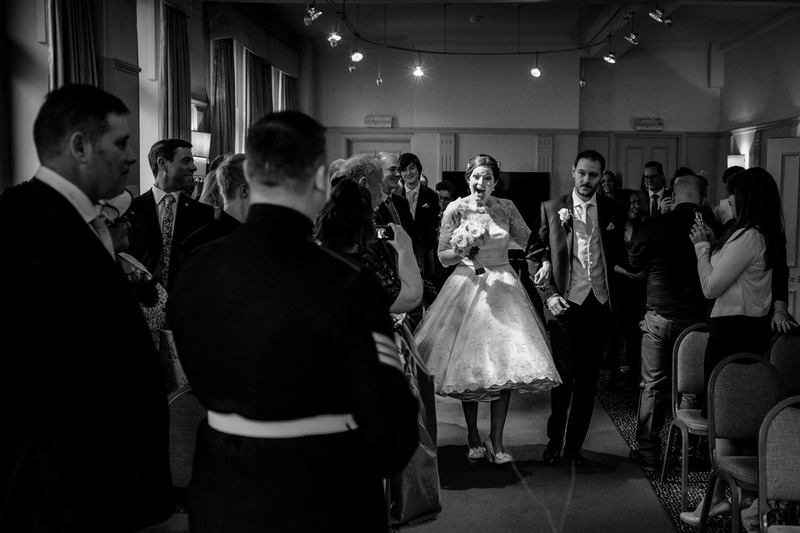 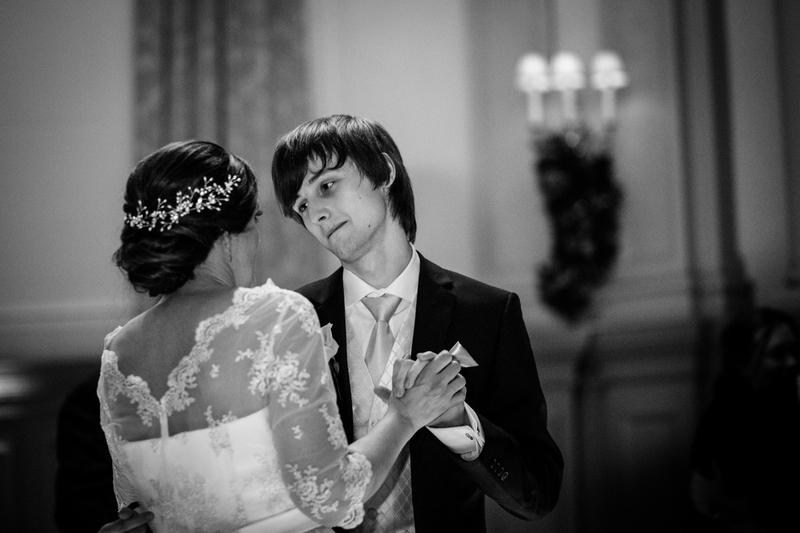  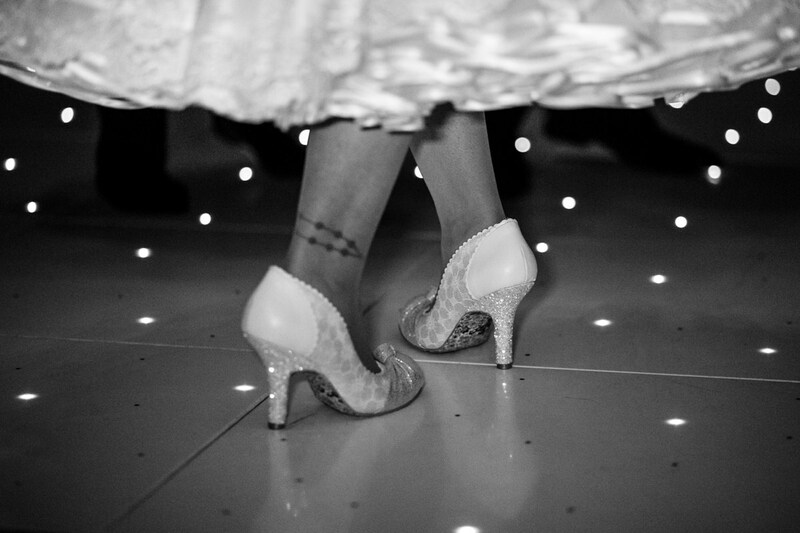 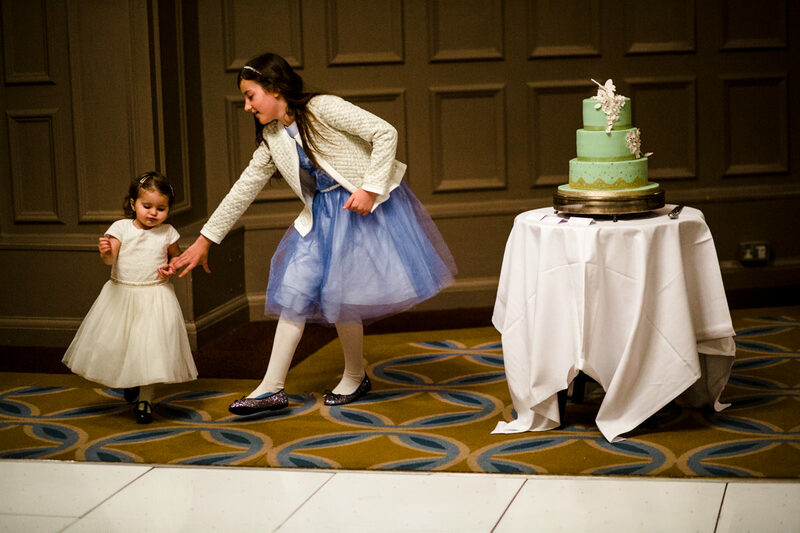 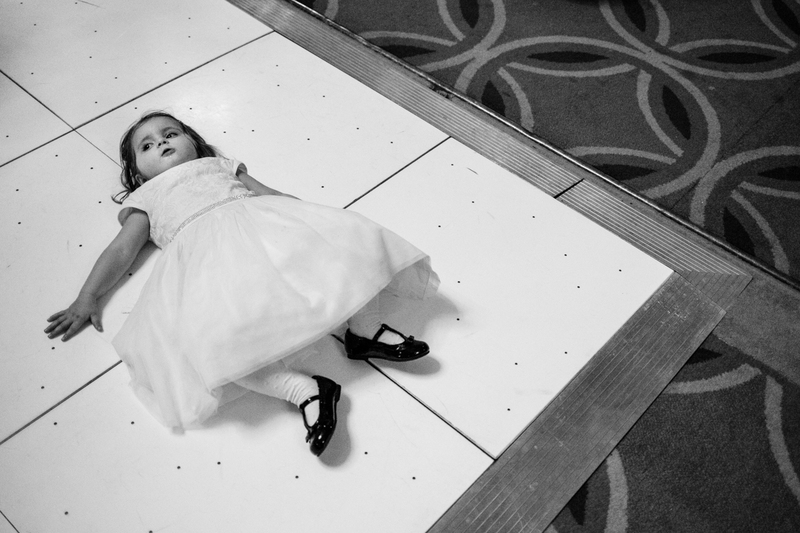 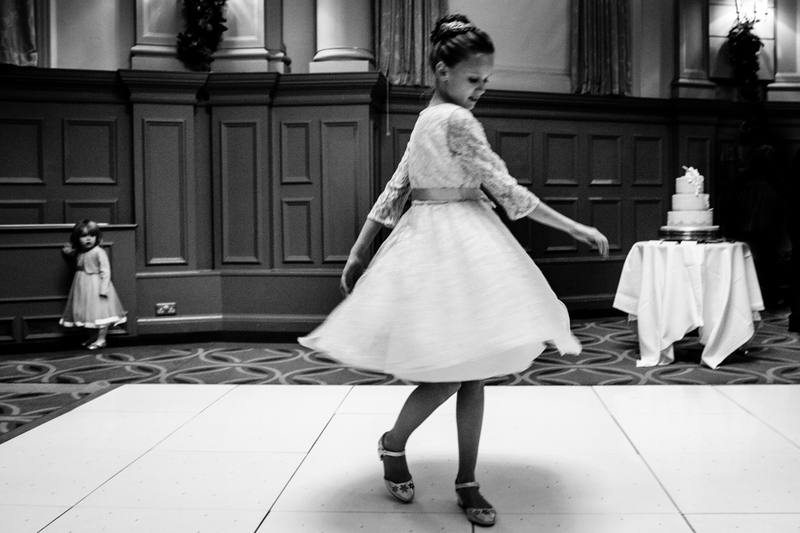 If you’re looking for a documentary wedding photographer to tell the story of your Harte and Garter Hotel wedding, or any other location, I’d love you to get in touch.